One of the best ways to increase home value is to capitalize and improve access to your panoramic view. Some design choices may mask or overshadow your home’s view, while other choices can dramatically enhance the natural aesthetic. Take advantage of your outdoor view by integrating it as seamlessly as possible into the interior design of your home with frameless sliding glass wall systems. Use a “less is more” approach, to framing your picture perfect vista. Make the most of your beautiful home’s view–whether it be cascading mountains, watery beachside scenery, or a captivating cityscape. Wrap yourself in your surroundings with these design suggestions to highlight your scenic view, and you will be transported and transfixed every time you step into the room. Maximize your enjoyment of the view and strive to eliminate visual obstructions. 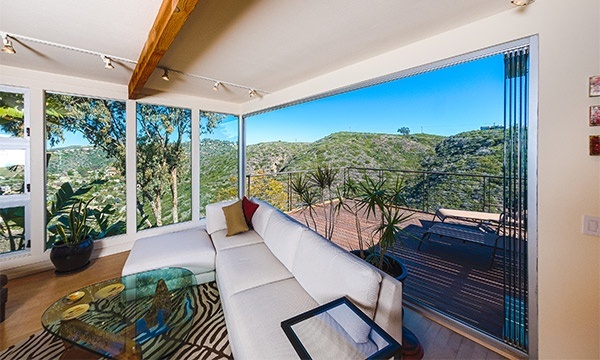 Whether you choose to focus on your view or merely provide the setting or backdrop to your space, consider opening up the room with the modern design technology of frameless sliding glass doors and windows. These modern and elegant features allow you to transform your space and truly Welcome the Outside In™. If you love your home’s panoramic outdoor view, why not make your scenery the focal point of a room? When privacy isn’t a concern, you can simply leave your sliding glass door system bare. You could also hang floor-length panels about 10 to 12 inches above the window frame. Doing so can enhance the height of the room by lengthening the line of sight. It also works to enhance the majesty of your panoramic outdoor view and offer privacy when required. Furniture plays a big role in a room whose focus is to take advantage of the view. Furniture orientation should focus on room flow and function as well as design. When you orient your furniture to draw attention to the prominence of your view, occupants of the room should be seated in a such a way that they can’t help but notice it. When possible, try arranging your furniture to face the view. Positioning your sitting area towards the focal point is a good start–but consider what else this might entail. A built-in sitting area can be the perfect component to accent the room with a view. L-shaped window-seating invites the casual viewer to bask in the surrounding background. Try a sofa in the room’s center with a console table to the rear, and a couple of chairs adjacent to the open the view. Or angle your bed towards a view worth waking up for. Using the “less is more” approach means paring down accessories, but retaining the right elements in your decor to accent your scenery. Minimal accessorizing is required when you have such a desirable backdrop as a focal point. The fewer distractions from the glorious view, the better. Conversely, a great view can be a great backdrop for some spectacular work of art you’d like to showcase, given the colors are cooperative with the palette of your view. There’s no need to over-accessorise and detract from the grandeur outside your window. Glass tables offer a translucent option that works well with most settings. Metal and wood options open up even more design possibilities. Consider your home’s overall design theme and choose one to suit your level of luxury and style. Try using a complementary color scheme in your decor. You can use subtle browns and greens to bring out the verdant scenery of your view. Natural tones and clean lines make their own statement as they let the scenery be the star of the show. Blend your interior with the exterior by using transitional elements that incorporate elements of your scenery, possibly mimicking the textures and delving into the natural color pallette your landscape provides. Keep total colors to a minimum to emphasize the natural beauty outside your window. Making the most of your panoramic outdoor view, whether it remains the backdrop or if you’ve made it the focal point of an area, may require exploring different floor plan options. 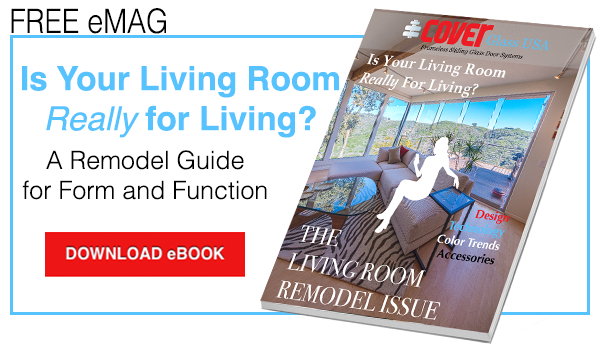 The open floor plan is an increasingly sought after design within many modern homes. Not only is an open floor plan more spacious, but it also expands the range of creative elements within a room. Frameless sliding glass wall systems and interior glass walls offer privacy and accessibility. Organizing your home within an open floor plan opens up so many possibilities, including increased flow and function of design. The more of your space you see, the more you are able to use and enjoy it. If you can enjoy the same beautiful view from the living room area and the kitchen, why not take that opportunity? Use long, unobstructed frameless sliding glass wall systems to appreciate the beauty of your view. Frameless glass walls make the most of an open floor space and help to best utilize your scene as a design focus.